The Mother of Eyeshadow Palettes. Today marks TWO WEEKS until the final season of Game Of Thrones begins. We’ve got the viewing party planned but we’re missing one thing to make sure we’re GoT ready: the ~look~. It ain’t no party if you don’t slay, are we right? Urban Decay has released a Game Of Thrones makeup range to help you look like the queen you are (Cersei Lannister eat your heart out). The full range includes a Game Of Thrones Eyeshadow Palette, Mother Of Dragons Highlighter Palette, Dracarys Lip And Cheek Tint, four different coloured 24/7 Glide-On Eye Pencils, as well as lipsticks named after your favourite badass women. The collection also includes some brushes in the shape of Arya and Jon’s swords so you can feel just as cool applying your makeup as you will look. Not to mention the shimmer palette has us weak at the knees. It has a bunch of Mother Of Dragons-themed colours as well as King’s Landing, Winterfell, and Hardhome. We can’t wait to create some cool AF looks. Need some more inspiration? Visit the Urban Decay website. The new products have been used to create a bunch of looks inspired by House Stark, House Targaryen, House Lannister, and the White Walkers. The collection drops on Saturday, 13 April. 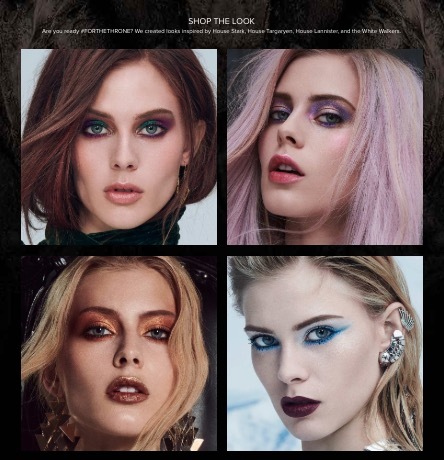 Sign up here to be the first to know when the Urban Decay x Game Of Thrones collection arrives. Images: Urban Decay / Instagram.